Ikea is set to open its second outlet in Dublin this summer after agreeing a 10-year lease with Irish property group IPUT plc for a store in Carrickmines. The premises will be Ikea’s first Order and Collection Point here and is part of the retailer’s plan to test new concepts in the Irish market to make it more accessible to customers. At 15,000 sq.ft, it will be a scaled-down version of the Swedish home furnishings giant’s superstore in Ballymun, north Dublin, which opened in 2009 and includes a restaurant, crèche and parking for about 1,850 cars. It is understood that Ikea has agreed a rent of about €40 per sq.ft at The Park in Carrickmines, which equates to €600,000 annually. Niall Ringrose, IPUT’s head of property management, expressed his delight at securing Ikea’s newest offering for its retail scheme in Carrickmines, south Dublin. “Ikea is iconic, and the global leader in the home furnishing market,” he said. The Park is located at Junction 15 on the M50 motorway. Tenants include Smyths Toys, DIY chain Woodie’s, Curry’s/PC World, Halfords, Next, 53 Degrees North and Hickeys/Home Focus. 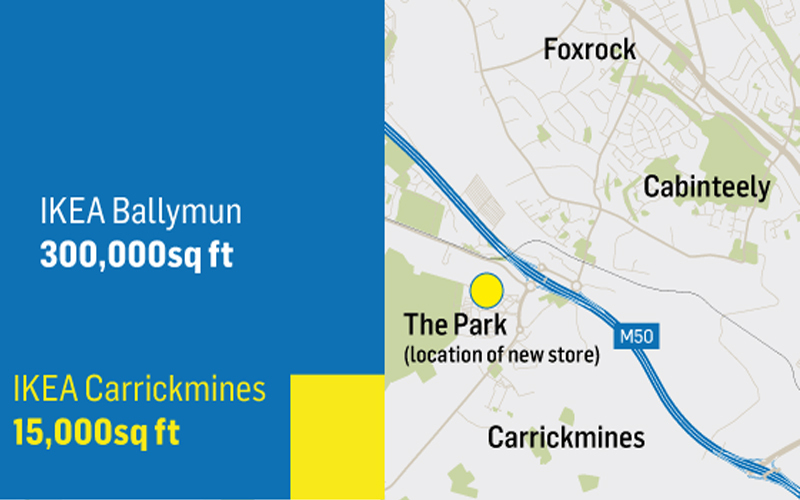 The Carrickmines store will give Ikea a presence at both ends of the busy M50 motorway. Ikea’s store in Ballymun has been highly successful since it opened. In the year to the end of August 2015, Ikea Ireland Ltd increased its profit by 84% to €13.1 million. Its turnover rose by 17% to just under €132 million. The retailer employed 469 staff during the year. The smaller format will act primarily as a planning studio, where customers will be able to speak with staff and ask for advice when making purchases such as kitchens or wardrobes. Customers will have the opportunity to touch and test the product range and to collect orders made online or in the store. The store will also include a café and will have a limited range of products that customers can buy and take home on the day of their visit. Ikea launched this concept into the UK last year and currently has Order and Collection points in Aberdeen and Norwich.